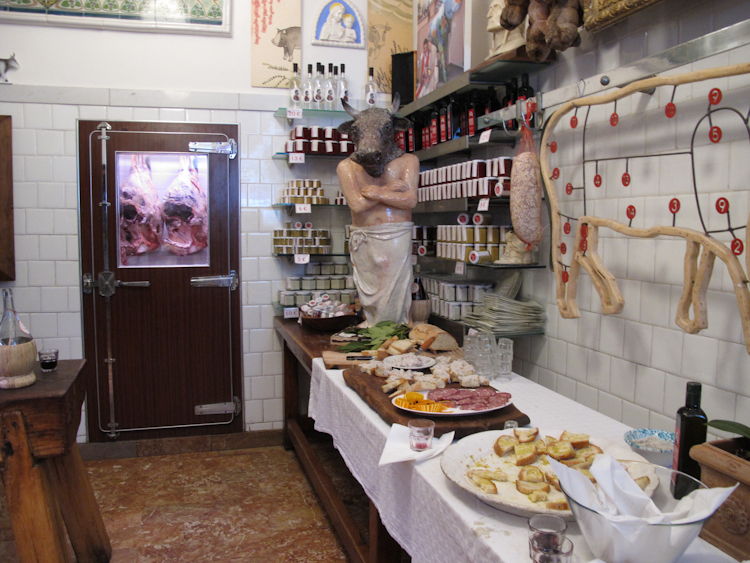 Antica Macelleria Cecchini!- A gem in Panzano | Dives and travels of an adventurous girl! 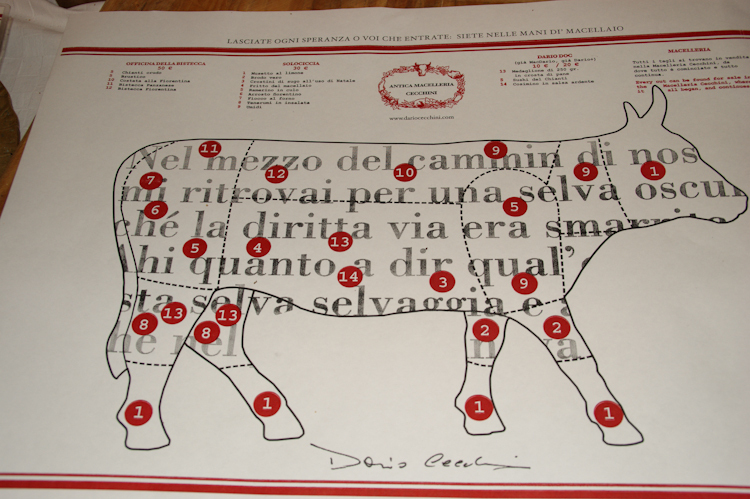 We had read about Antica Macelleria Cecchini on the web, http://www.dariocecchini.com, but never thought we would find this meat lovers’ paradise in small Panzano. We parked our rental and asked a local if he knew of this place. 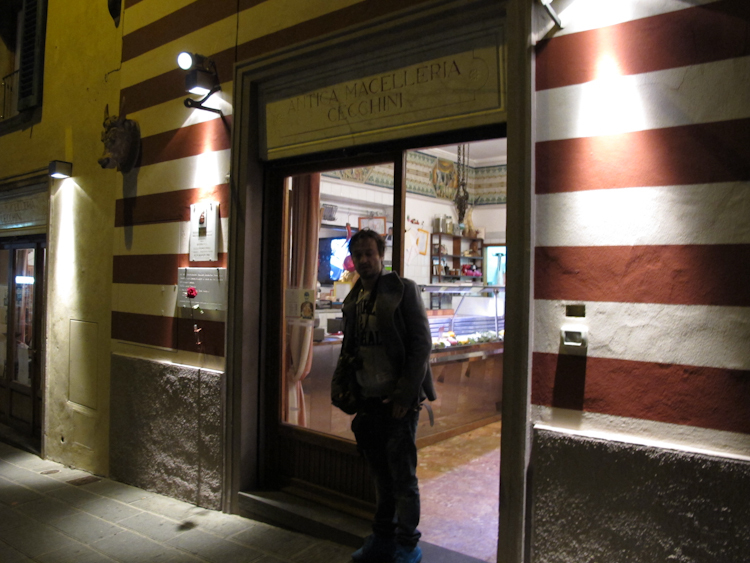 In an ugly blend of English and Italian, we managed to communicate and he told us the place was the one with the many lights outside; moreover, he greatly recommended we pay this place visit. 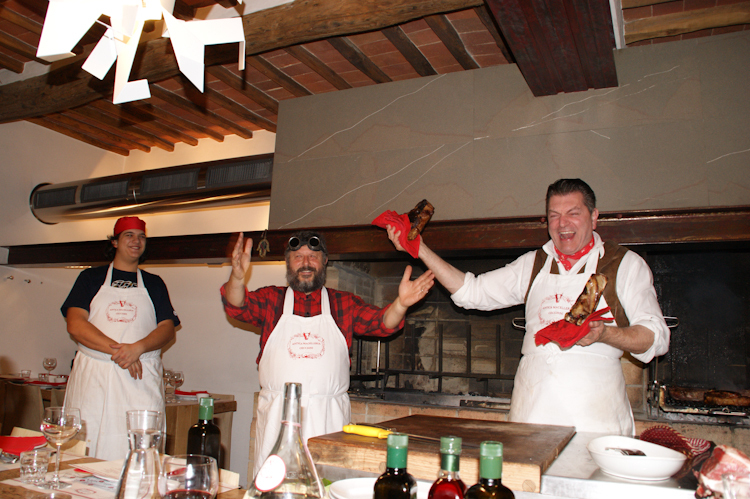 The moment we walked into the macelleria (butcher shop, in Italian) Dario Cecchini, posing a very tall and impressive figure, welcomed us inside his shop which has been operating for 250 years. 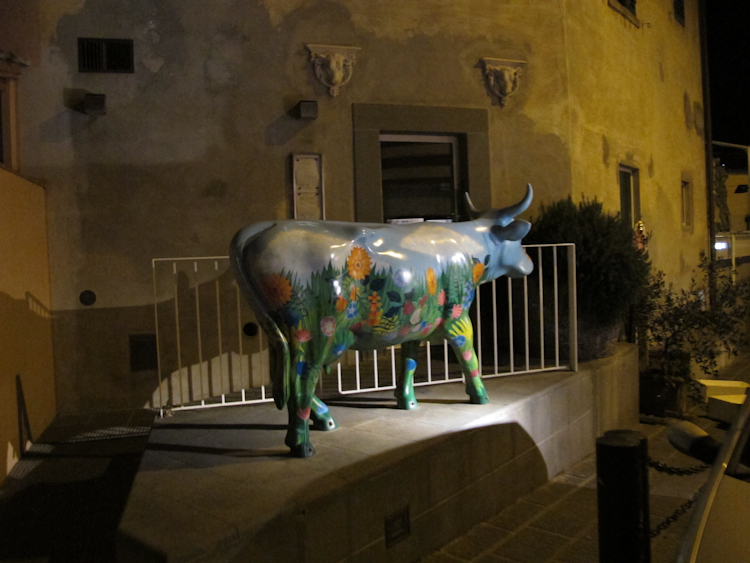 Panzano is a quiet, small town with very few shops. 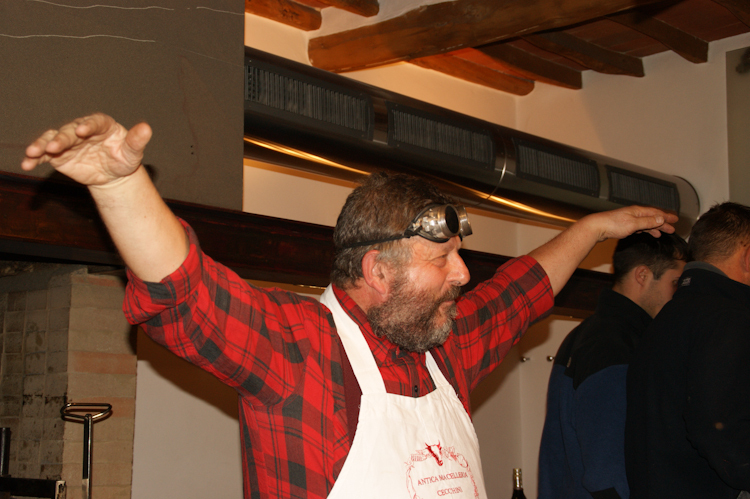 Dario has managed to make it a lively and popular place and one can say he is serving as an ‘ambassador’ of the area. 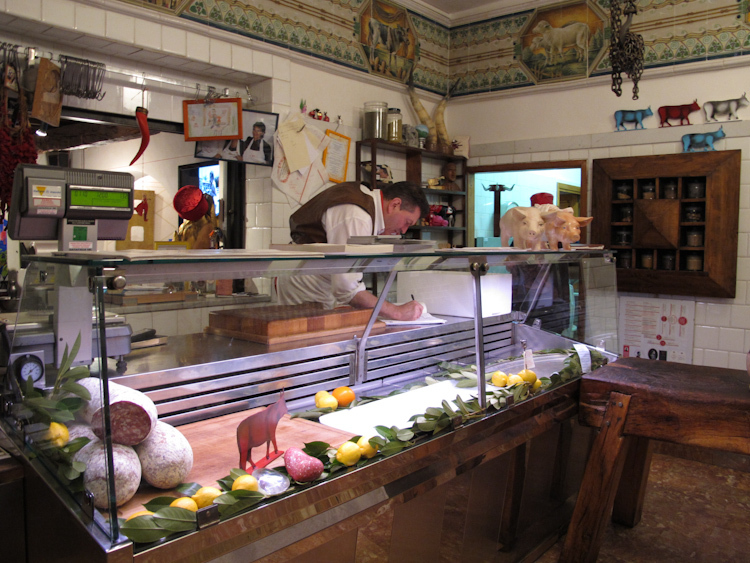 The shop did not remind us in any way of a butcher shop; it was more like a boutique shop, spotless and very nicely decorated! 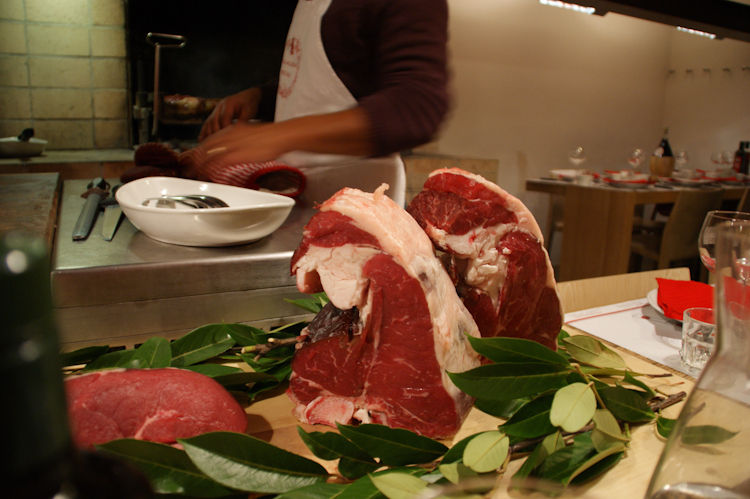 The idea of a slaughter-house with blood and chunks of meat everywhere that one has in mind when thinking of a butcher shop was definitely not to be found there. 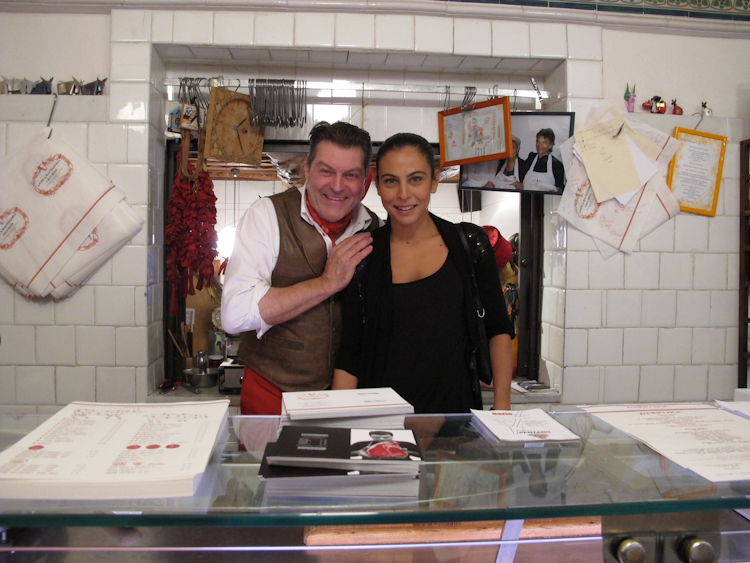 Upon entering the shop, Dario immediately offered us some rosso (red) wine along with Italian meat delicacies such us fennel flavored salami, pecorino cheese and of course the ‘Chianti butter’ on bread or as Dante, the manager of Dario’s restaurant said, Italian ice-cream! 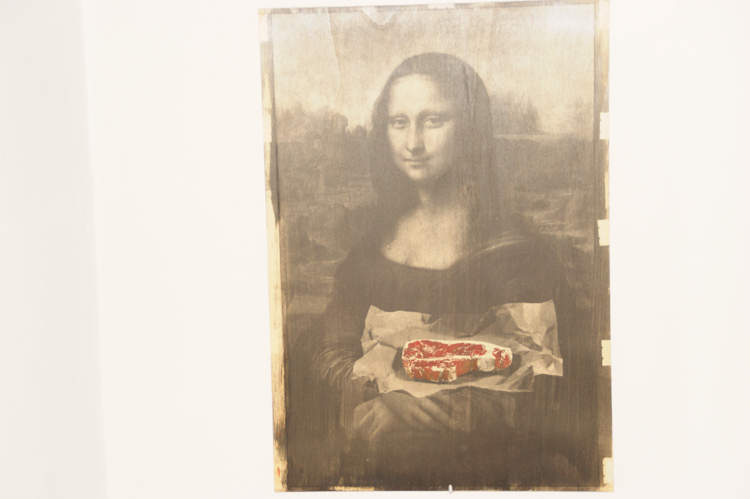 It is actually made of pork fat together with various spices and vinegar. 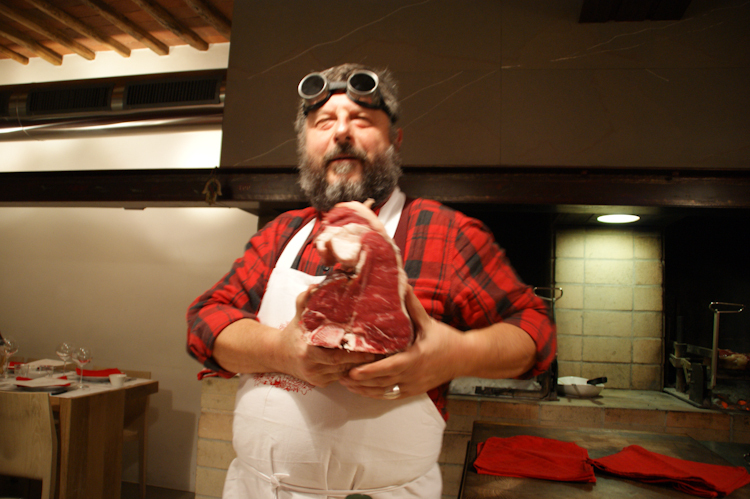 After discussing for some time with Dario, it was time to go upstairs to his restaurant Officina Della Bistecca (steak workshop) which opened in 2009. 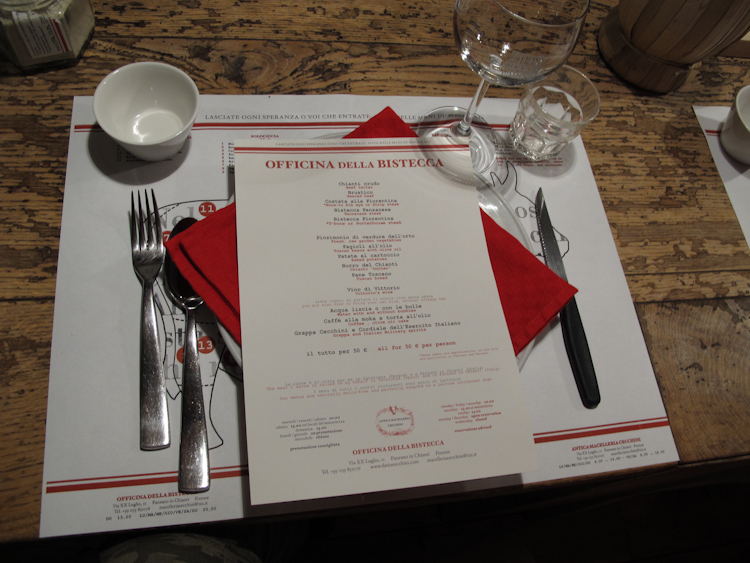 It was funny as I asked Dario if they serve pasta and pizza and he replied in a very definite manner ‘here you will find only bistecca, pizza and pasta tomorrow’. 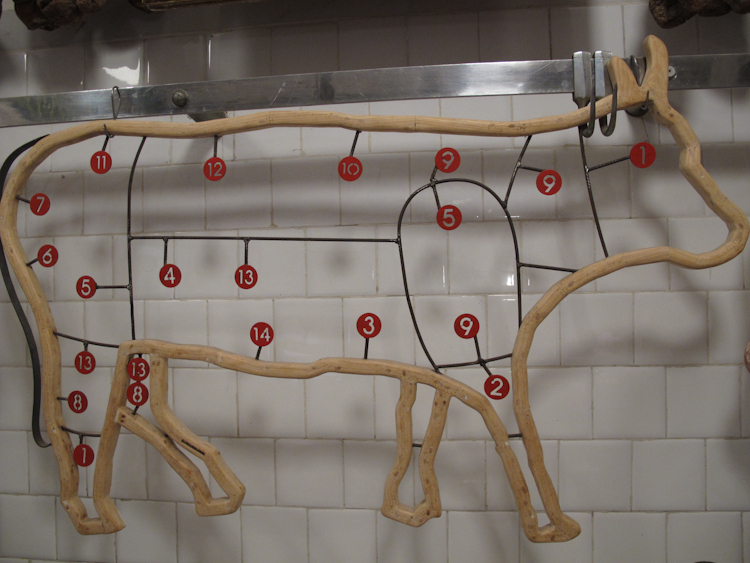 The artisan butcher’s idea behind this restaurant was to teach people that there is more to veal than a t-bone steak. 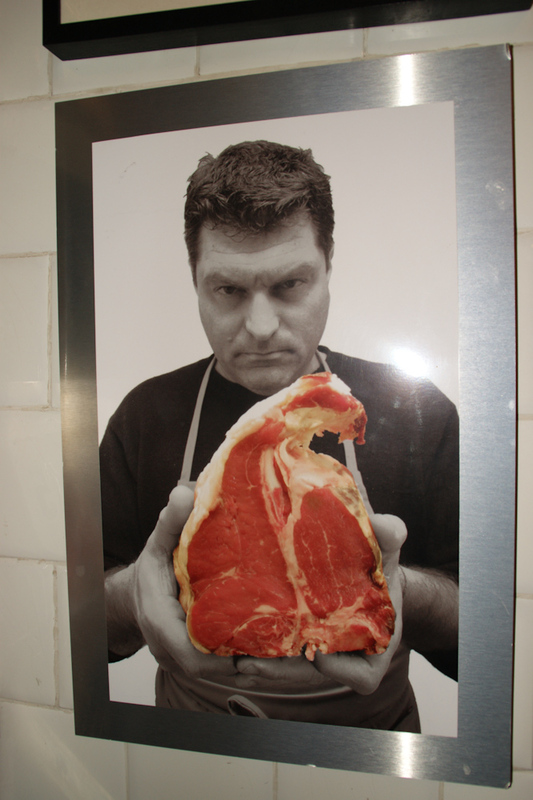 He promotes other different delicious cuts such as the Ostata, the Fiorentina and the Panzanese. 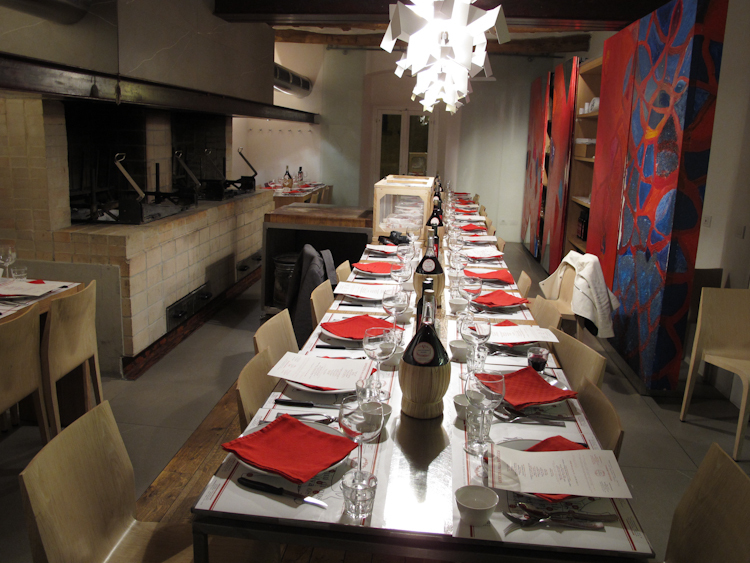 An electric wall opened in his butcher shop and we entered a beautiful and very modern restaurant. 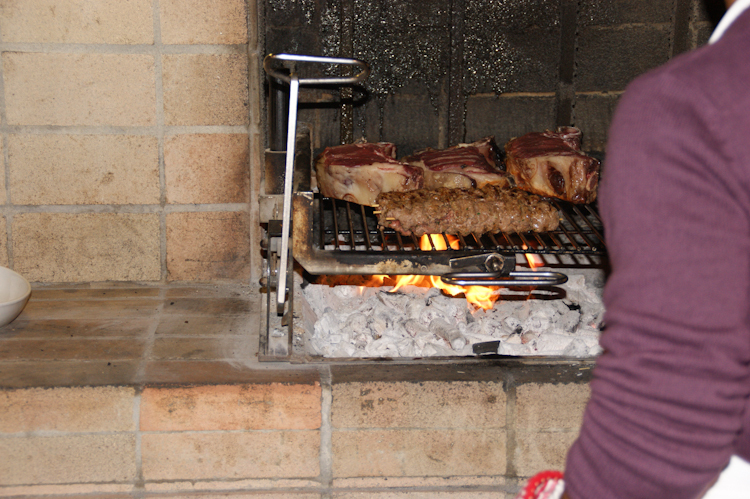 The fire was set up on an open grill in the restaurant; the meat was placed in a special net box in front of the table where all guests sit together as one big company. 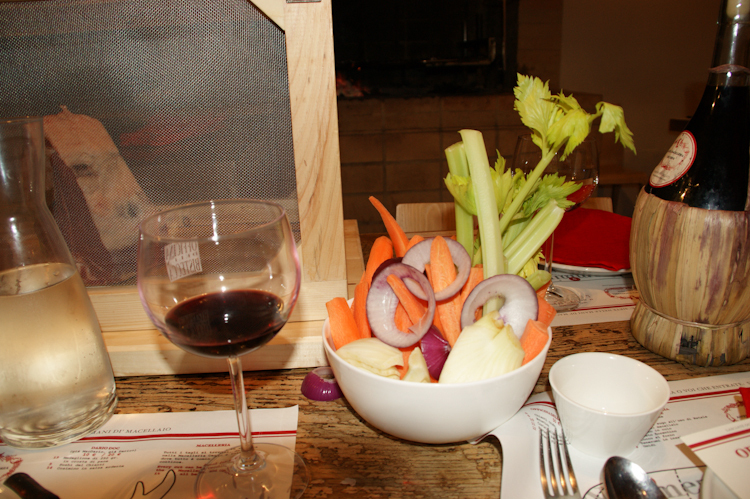 Dante prepared for everyone a small bowl with fresh olive oil, homemade Tuscan bread, a mixture of salt pepper and herbs and brought some fresh vegetables to dip! The procedure was a proper ritual! 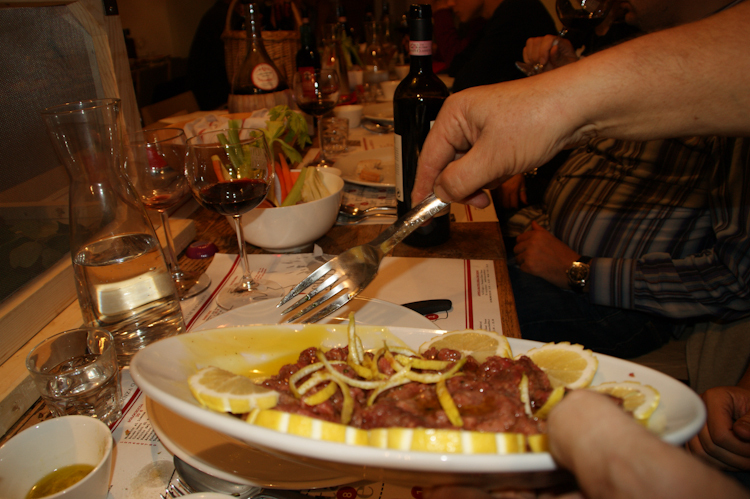 The first plate was served to us by Dante, with his exceptional humor; Beef tartar also known as the ‘Sushi of Chianti’ with lemon which was delicious. Then we were offered seared beef which is practically the same as beef tartar, the only difference being that it is grilled. 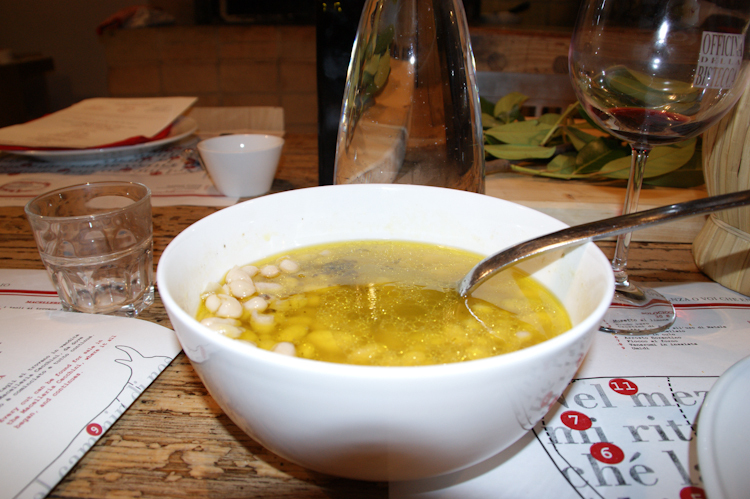 We were then served Tuscan beans with olive oil which were very tasty and had nothing to do with the typical bean soup that one would expect. Then it was steak time!! 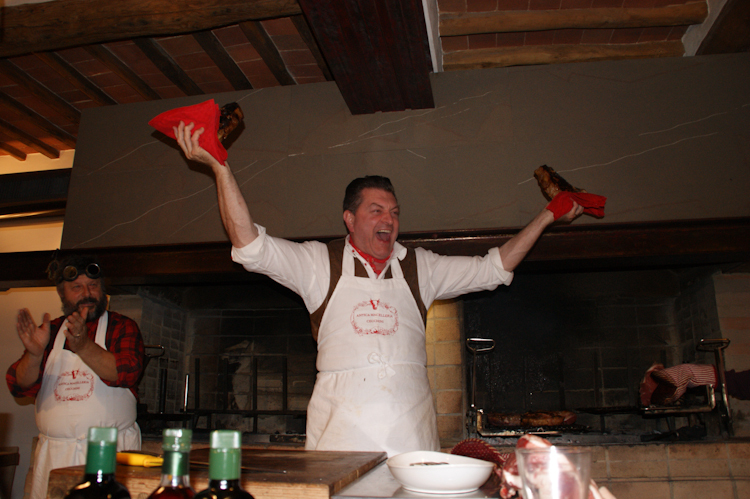 Dario Cecchini went in front of the grill, welcomed his guests, presented everyone working in the restaurant and then in a very unique manner presented us with the Steak! 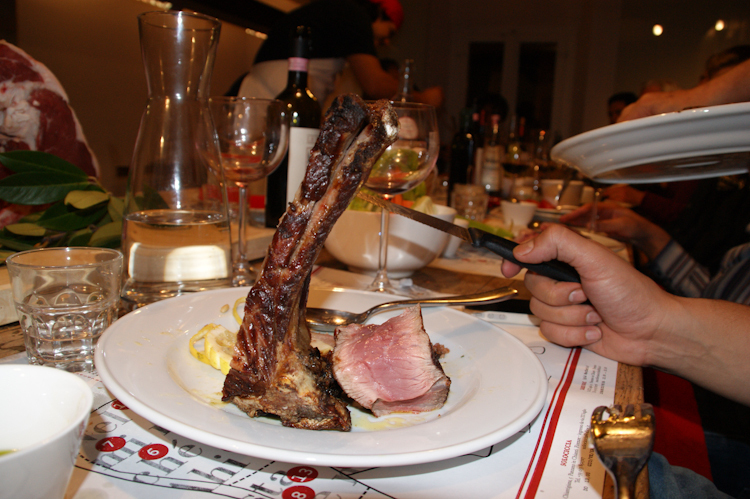 We had Bone in Rib eye steak first, then Panazanese Steak and finally T-bone steak which was served with a baked potato and of course the ‘Chianti butter’. 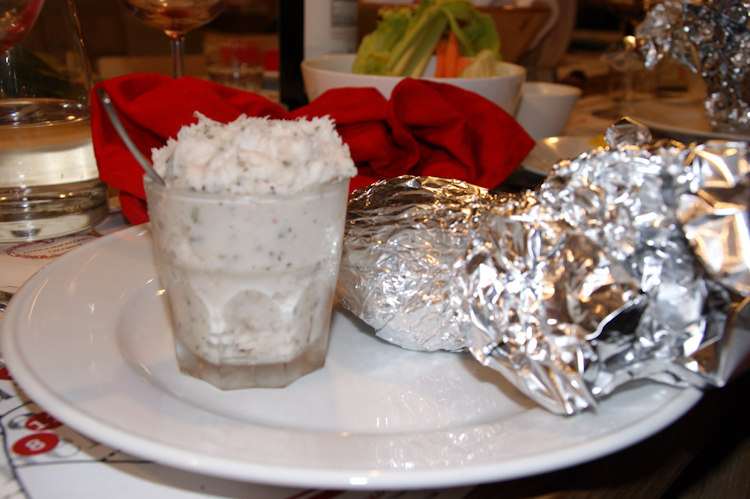 They were all delicious and Dante kept serving us more and more. We were so full but could not resist from eating that extra bite. 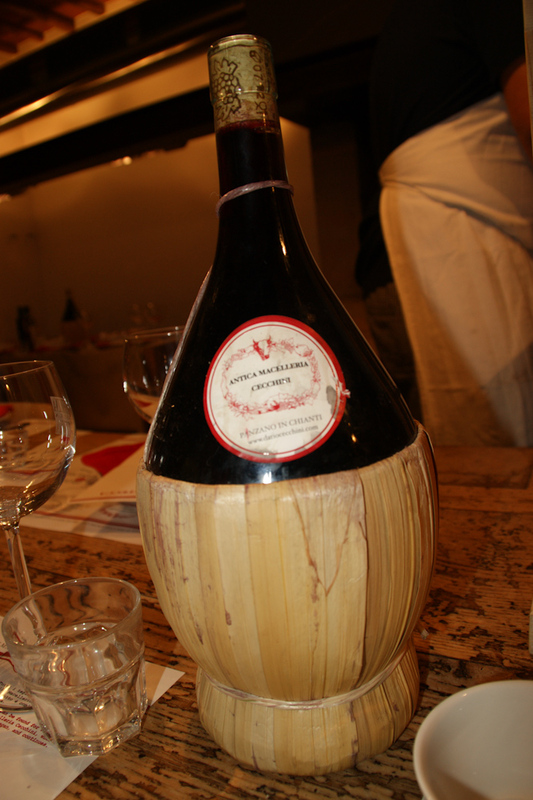 The locals had all brought their own homemade wine so at some point the table was filled with various red wines. 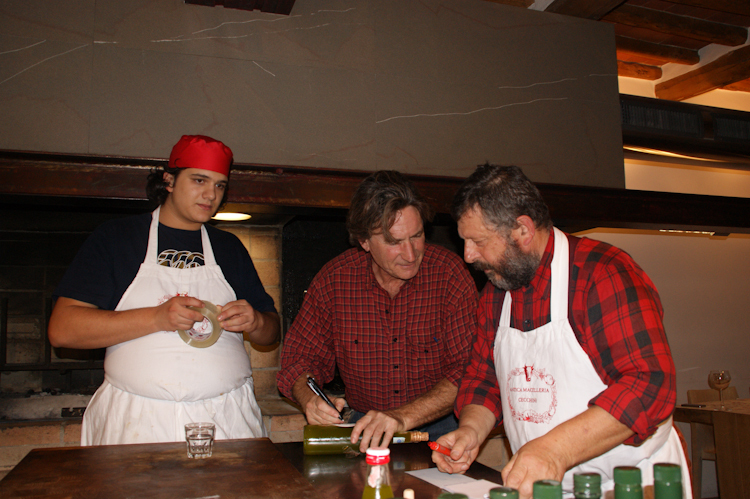 There was an Irish man, Mr. John Roche who moved to Panzano and was producing his own olive oil. 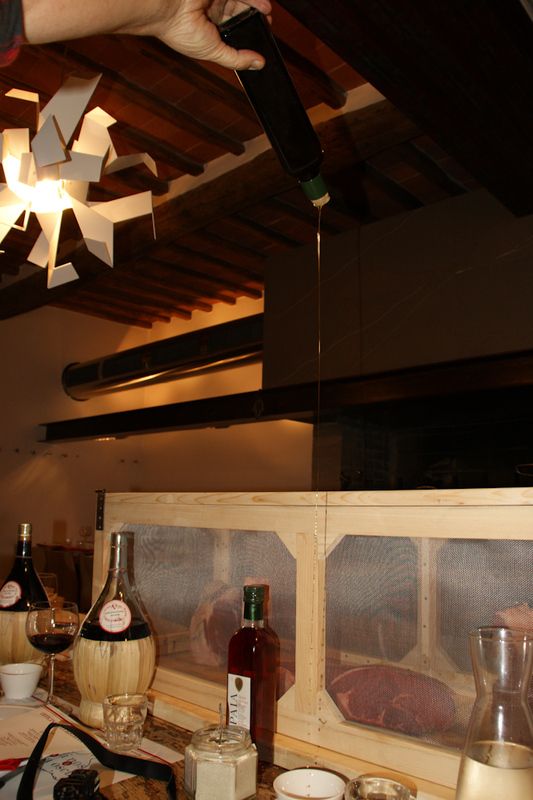 That night he had just produced his first batch of oil for the year; it was still hot, and he went to his car and filled a bottle for us to take home. That was very sweet of him and we thank him! 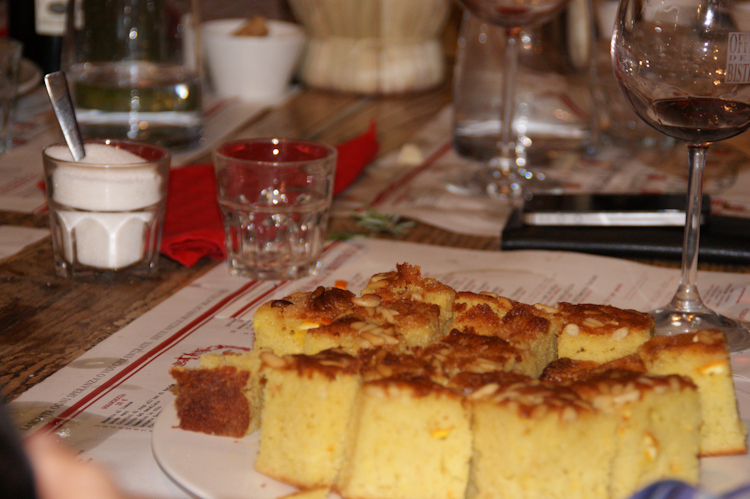 Dante then brought everyone olive oil cake and Vinsanto wine, otherwise known as the ‘holy wine’ which tasted delicious. 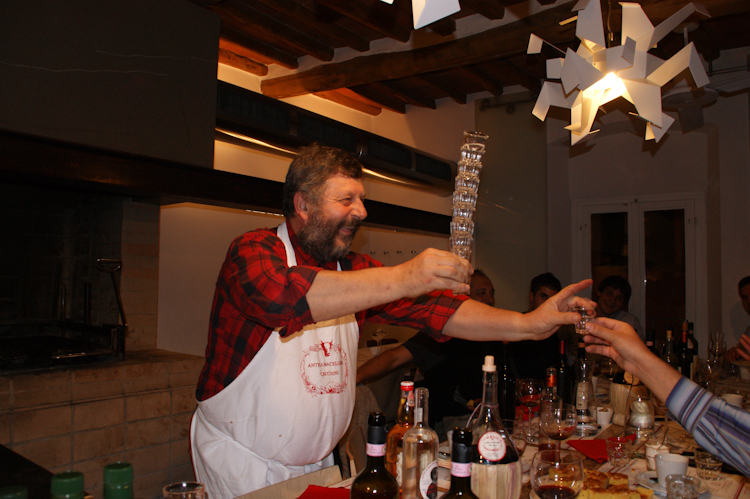 To sum up the evening, we were offered as a digestive, a shot of ‘Grappa Cecchini’ and an Italian Military spirit. Coffee was also necessary as we had to drive back to our hotel! 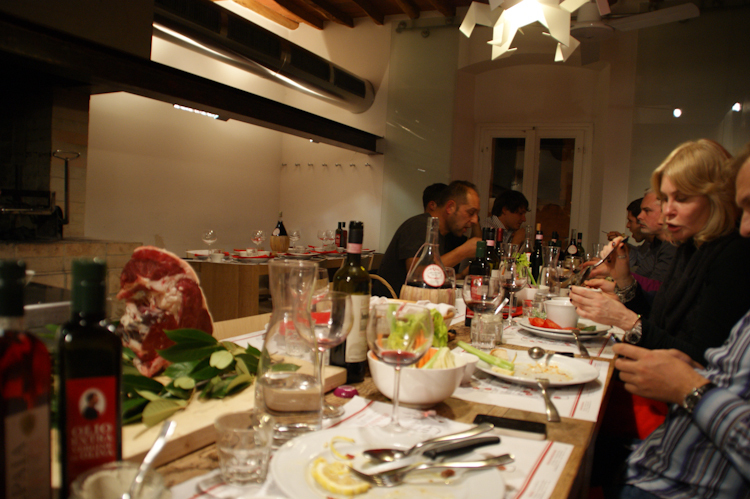 The menu at Officina Della Bistecca is 50€ per person inclusive of everything! Really worth it! Amazing restaurant and delicious food !!!! 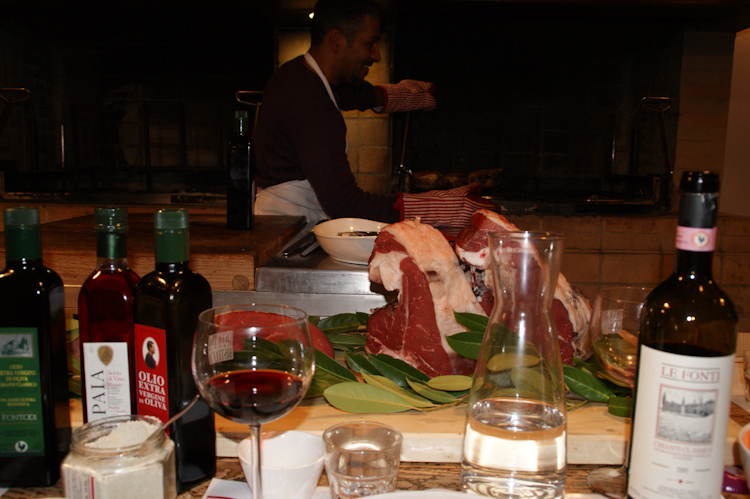 a must if you visit Tuscany! Looks like a fun place and I like that they have vegetarian options. OMG! What an experience! I’m sooo jealous! *laughing* that looked like an extremely fun night! 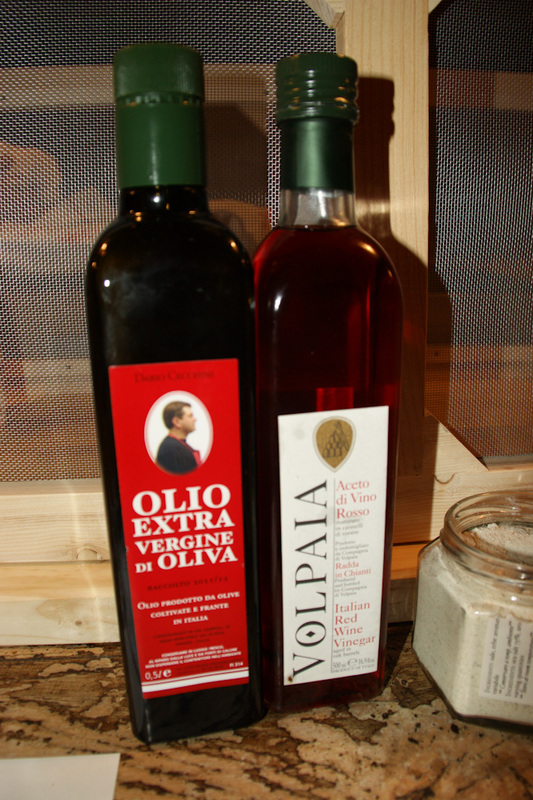 I love love olive oil! Thank you Paula 🙂 🙂 it was a very fun evening and the food was amazing! 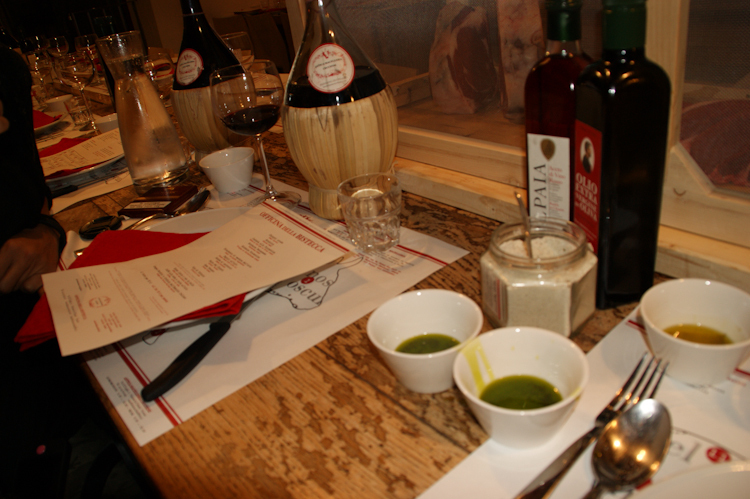 I am not a big fan of olive oil (for calorie reasons :P) but the one we tasted there was really good!!!! 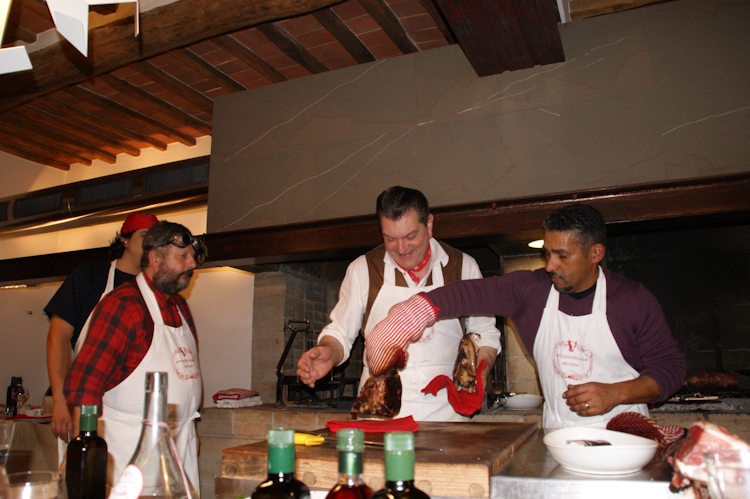 It was a marvellous experience! They are so happy and funny! And the meal was superb!